Our team of instructors at Scuba Shack Koh Tao have been working together for nearly 5 years. We offer the full range of PADI courses in a variety of languages including French, Spanish, German and Swedish. Our aim is to make your trip to Koh Tao an enjoyable one both above and below the water. Need accommodation? Want to know a good place to eat? Where’s best to rent a bike? Whatever your question, we are always happy to help in any way we can. Meet our team of Instructors and Divemasters. 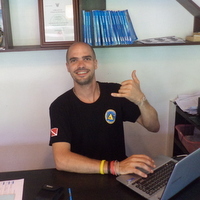 Stefan has been happy to call Koh Tao his home for the past 6 years. 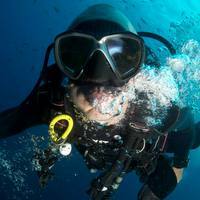 While working as a PADI Master Scuba Diving Instructor and Manager on Koh Tao he realized only a dive shop owned and managed by a scuba diver could give customers the best experience possible. In 2014 he opened Scuba Shack Koh Tao and now spends his time making sure his customers are looked after above and below the water, while spending as much time with his wife and daughter as possible! Originally from London, Jim recently moved back to Koh Tao after spending a year traveling with his wife. 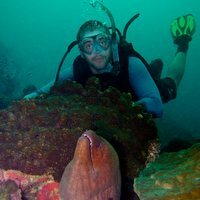 With over six years experience teaching on Koh Tao and over 1000 students certified, Jim is one of the most qualified instructors around. He and Stefan completed their Divemaster training together in 2009 and have worked together ever since. He is also one of Koh Tao’s newest fathers and can often be found on the beach giving his 2 year old daughter swimming lessons in preparation for her PADI Open Water course in 8 years. Max can be found on the Scuba Shack boat nearly every morning of the year whether he is working or not. He has dived all over the world but always makes his way back to the calm and clear waters of Koh Tao. 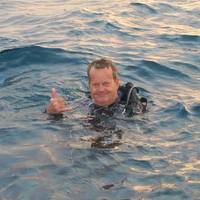 An avid underwater photographer, Max contributed many of the photos for this site and has an uncanny knack for finding lost treasures underwater. Check out more of his pictures on his Facebook page Scuba Max. Originally from Australia he has now called Koh Tao his home for nearly 5 years. Eric first tried scuba diving while on a holiday in Honduras, escaping his busy life in London. He instantly fell in love with it and from that moment on knew he wanted to be a scuba diving instructor. He decided to change his life and start fresh in the tropical dive paradise that is Koh Tao. He loves his job and it truly is his passion to dive every day and teach people how to dive, respect and protect our oceans. Originally from Slovakia, Erik is also fluent in Spanish.